1. Daffodil Delight is becoming a new favorite for me. Here it is paired with Marina Mist and Pear Pizzazz. The Ornate Blossom image will be available for purchase as a single stamp or part of the set Friends Never Fade in the new 2010-2011 Idea Book and Catalog beginning July 1. 2. The Greenhouse Gala Designer Paper coordinates beautifully with the images found in Friends Never Fade. It features the six colors Pear Pizzazz, Daffodil Delight, Chocolate Chip, Real Red, Pumpkin Pie, and Baja Breeze. Whether bold and bright is your pallet or something soft and subtle, there’s one sure to please. 3. If you missed the free Scallop Trim Border Punch during Sale-A-Bration, you’ll have a second chance beginning July 1. It will be available for purchase along with several new offerings. The space saving sleek design offers greater leverage and cutting precision. 1. This one follows the MOJO Monday 144 Sketch Challenge. The focal image is a 2010 – 2011 New Catalog sneak peak with the Friends Never Fade set. 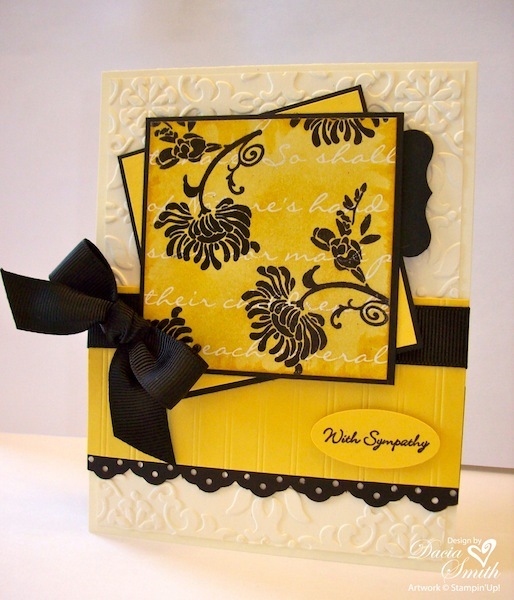 It is stamped on Presto Patterns Specialty Paper found in the Summer Mini Catalog and sponged in Daffodil Delight. Any new color line-up from the Brights Collection paired with Basic Black creates a stunning contrast sure to please. 2. Don’t you just love the deep background pattern of the new Vintage Wallpaper Textured Impressions Folder? Try layering Very Vanilla on Very Vanilla for a soft subtle effect. The technique is used again with the sentiment from Teeny Tiny Wishes. 3. The perfect finishing touch is the coordinating Basic Black Grosgrain ribbon, an old standby favorite. The 5/8″ Ribbon will be offered in eight new colors beginning July 1. 1. This one follows the June Scrapbook Template. Piece different colors, textures, and patterns in strips for a fun way to add a little drama to your project. The feature here is the Greenhouse Gala and Newsprint Designer Papers coming out with the new catalog, July 1. I just love how they work together. 2. All of the stamped images feature Black Embossing Powder. The glossy finish adds punch to the images and draws the eye to your handiwork. 3. Want to add a little punch to your scallops? Try using one of your circle punches. Place eight 1/2″ Circles in a row and apply Newsprint Designer Paper to cover half of the circle. You can play around with different size circles to create just the right look you’re after. 4. 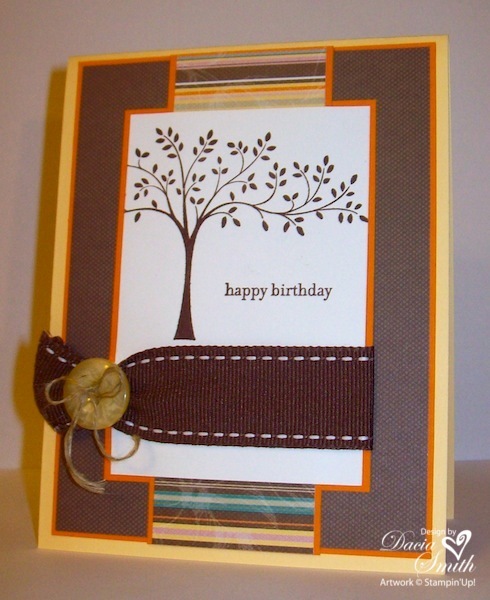 For the final touch, wrap Linen Thread around the card twice, and tie a little whimsy bow. 1. This one follows the Sweet Sunday Sketch Challenge 72 with Karen Giron. My favorite challenge is a sketch, and she is faithful to provide a great one each week. Give her a shout out, she’s celebrating her 9th anniversary! She left her kids with her brother in law and headed out of Dodge. Sounds like fun to me! 2. The stamped image is from the Flight of the Butterfly. This is a two-step set packed full of punch, a matching one that is. Gotta love those coordinating products. 3. The button from Button Latte, sports a little bling. It is straight from the Circle Fire collection of Rhinestone Brads. Punch it out of the hardware, add a glue dot, and pop it right in. You’ll love the sparkling effect. 1. Another background from the design elements found in the new Artistic Etchings Stamp Set in the 2010 – 2011 Idea Book and Catalog. The colors and designs are only limited by your imagination. 2. The rows of piercing on the focal panel gives it a manly touch. It is easy peasy to line them up with your Piercing Tool and Mat Pack. 3. The sentiment is stamped twice. The first time in Soft Suede and the second in Versamark using your Stamp-a-ma-jig for placement. Add Clear Embossing Powder and heat. 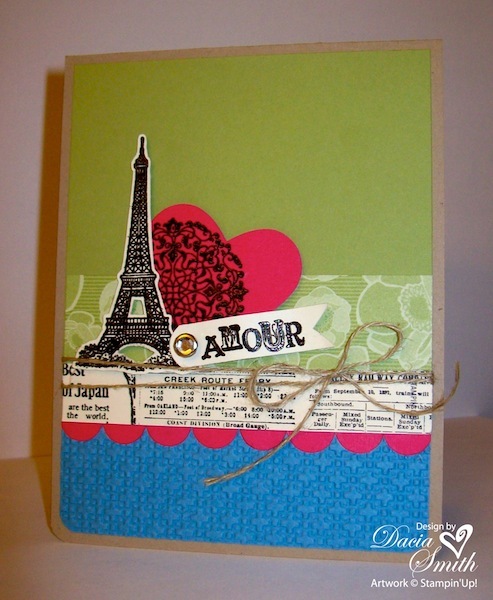 When the craft ink isn’t in your stash this is a great trick to try for a little added punch to your stamped image. 1. 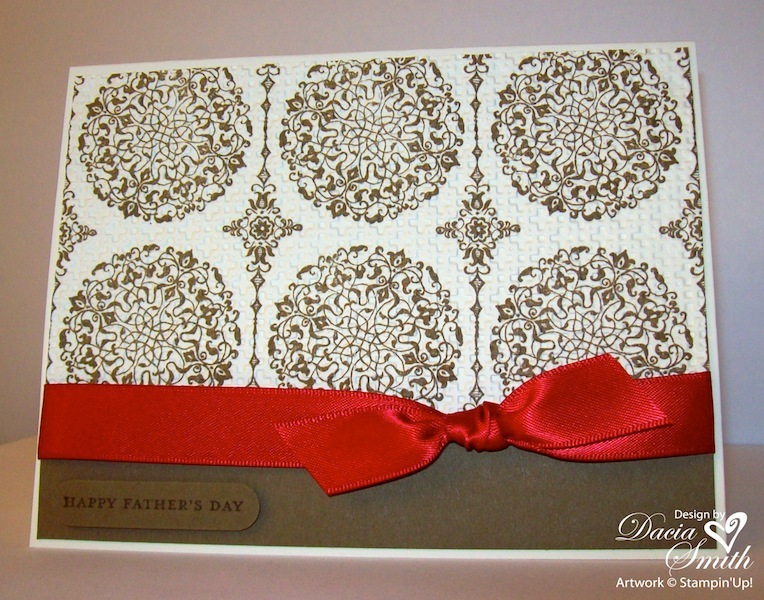 The awesome background is created using the design elements found in the new Artistic Etchings Stamp Set from the 2010 – 2011 Idea Book and Catalog. My goodies arrived yesterday! You know what that means, the sneak peaks begin. 2. After stamping, the card stock was passed through the Big Shot using the Square Lattice Impression Folder from the Summer Mini to add a little texture and interest. 3. 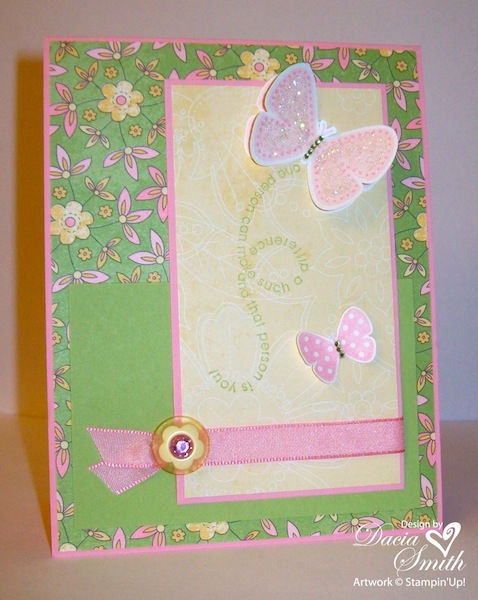 The sentiment from Teeny Tiny Wishes is popped up with Dimensionals to compliment the background. 4. 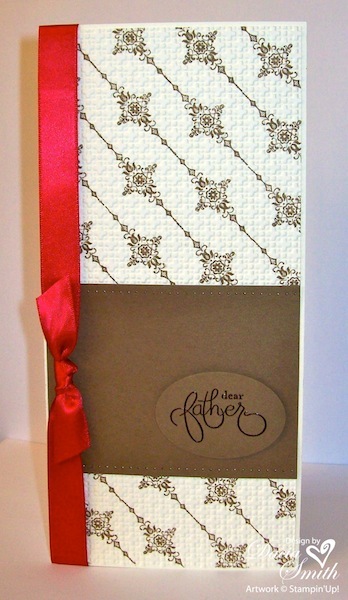 The pop for this easy Father’s Day card is found by adding the Real Red Satin Ribbon bow. I am so excited to learn the satin ribbon carried over to the new catalog. Guess what, they have also added new colors! You know what’ll be on my wish list this week. 1. The card for today’s post follows Taylored Expressions Sketch Challenge #115. 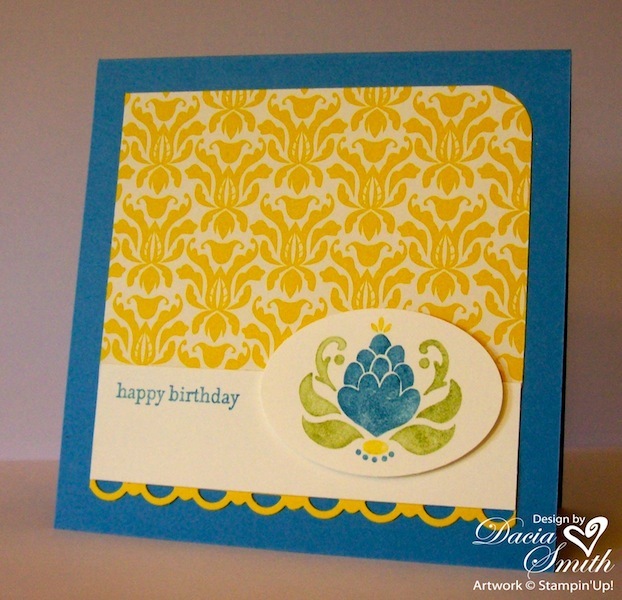 A sketch challenge is my favorite way to put together a card. It is so much easier to get where you’re going when you follow a map! Hope you will have time to play along this week. 2. My birthday stash is low on masculine cards. The earthy tone of Barely Banana, Chocolate Chip and Pumpkin Pie is a male favorite. Add a tree and you can’t go wrong. 3. The finishing touch is the wrapped Chocolate Chip Grosgrain Ribbon cinched together with a button from the Button Latte collection.